Governor of Edo State, Mr. Godwin Obaseki has said that strategic policy is one of the key factors that would help to sustain the socio-economic activities of any government. Governor Obaseki gave this admonition in his office yesterday when he received the Alumni Association of the National Institute for Policy and Strategic Studies (NIPSS), Kuru, Plateau State who were in Government House on a courtesy visit. Obaseki who expressed delight over the visit, said the membership of the association was a clear attestation of why the public has held the alumni in high esteem. The governor, who commended the association for producing one of their own as immediate past governor of the state, said his administration is focusing on the structural change of Adams Oshiomhole. 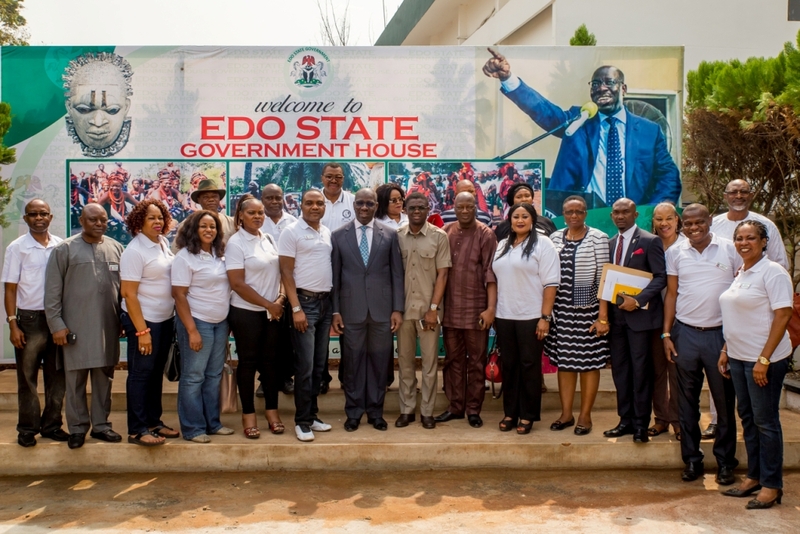 He added that in the area of capacity development, agriculture, mining and infrastructure, his administration will take advantage of the available potentials in Edo being a strategically located state. While expressing his administration’s determination towards creating 200,000 jobs, he said government had engaged Azura to boost the state power plant with about 450 megawatt. Other areas to be focused on according to him include, the preparation of 5,000 hectares of land in March for the year cropping season and the ongoing business and vocational workshop organized by the state government to address issues militating against primary education. The leader of the delegation and one time governor of Plateau and Katsina states, Rtd Major Gen. Lawrence Onoja said the purpose of the visit was to congratulate him on his victory at the poll, and also to appreciate the achievements recorded by his predecessor, Comrade Adams Oshiomhole who is an alumnus of the association. He charged the governor to build on his legacy, adding that Oshiomhole’s style of leadership has brought transformation to the people of Edo State. He used the opportunity to advocate peace in Africa, stressing that the recent killings of Nigerians in South Africa is quite barbaric and unacceptable. Among the alumni present during the visit were Rtd Major General Airhiavere, Fmr Minister of Women Affairs and Social Development, Mrs Josephine Anineh and the Executive Director of Edo State Board of Internal Revenue Service, Chief Oseni Elemah.